End of February DISD received an important guest from Frankfurt am Main. 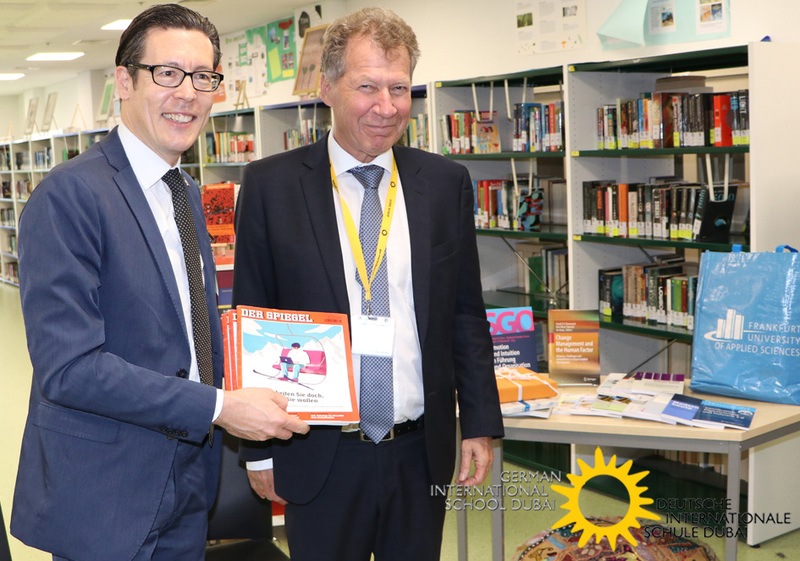 Prof. Dr. Frank Dievernich, president of the Frankfurt University of Applied Science (Frankfurt UAS), made a stopover at Dubai to exchange ideas with the DISD principal Helmut Jolk and secondary school students. 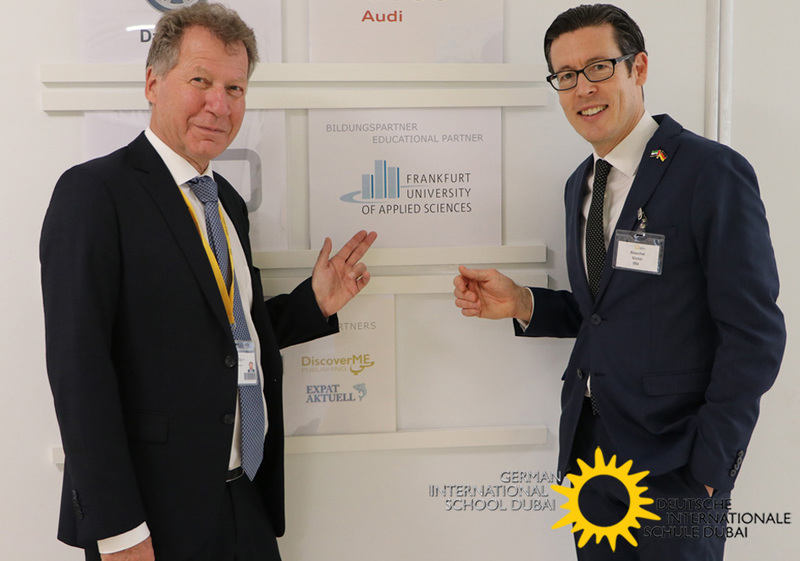 Since October 2018 Frankfurt UAS is an educational partner of DISD. It is important for the university that this partnership is defined by an active exchange and personal contact. During the talk, Prof. Dr. Dievernich was very interested in the plans of the future students and gave them many tips for choosing the right university. He also took the opportunity to introduce the Frankfurt UAS and was open to all kind of questions about the studies or the campus. Further he officially presented the first issues of the Spiegel magazine subscription, that the university donates to DISD as part of the cooperation. Frankfurt UAS offers a wide range of practice-oriented degree programs in the fields of Architecture, Civil Engineering, Geomatics, Computer Science & Engineering, Business & Law, as well as Health & Social Work. In the DISD Secondary School Library, on the Frankfurt UAS shelve, the students can find a selection of books written by the university’s faculty to get a glimpse of the offered studies. In addition, the Frankfurt UAS offers its prospective students from DISD individual support. This includes targeted information and advices, as well as a simplified application procedure and assistance with finding an accommodation. DISD students and their parents spending the school holidays in Germany are cordially invited to take the opportunity to pay a visit to Frankfurt UAS and get personal advice. More information is available on frankfurt-university.de or through the program Betreuungsinitiative Deutsche Auslands- und Partner-Schulen (BIDS) initiated from Deutscher Akademischen Austauschdienst (DAAD), available via bids@io.fra.uas.de or +49 (0)69 1533 3371.